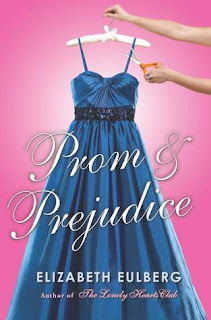 I've had a copy of Prom and Prejudice by Elizabeth Eulberg on my shelves unread for absolutely ages. I'd read and really enjoyed a previous book by Eulberg and thought it quite cute and fun. And as I quite enjoy retellings of Pride and Prejudice, I thought I'd give this one a go. And while I definitely left Prom and Prejudice on my shelves for far too long, it was exactly what I was expecting it to be when I did finally pick it up. In Elizabeth Eulberg's version, Lizzie Bennett is a scholarship student at Longbourn Acadmey. And all the girls are all absolutely obsessed with prom. It's a huge fashion spectacle and all the wealthy and snobby girls at Longbourn don't look very kindly on the 'charity cases' like Lizzie and her friend Charlotte. That is except Lizzie's wonderfully kind and beautiful roommate, Jane. So when Jane gets all excited about the arrival of Charles, the boy she was flirting with before he left for a semester abroad, Lizzie agrees to tag along to the reception being held for the returning students. For months, Lizzie has been picked on by the other students, she's been made fun of and laughed at, she's been humiliated and had sticky liquids thrown at her. So she's not best pleased at this reception party when she meets Charles's friend, Will Darcy, especially when he's very snobby and stand-offish as well. And when she overhears what Darcy has to say about her, she's completely made up her mind about what sort of person Will Darcy is. And so the story begins. And Prom and Prejudice was hugely fun! I could definitely picture a school full of wealthy teenagers in New York to turn prom into this massive deal that's covered by fashion magazines and making it a very exclusive event with designer labels and all. With a few simple changes, we really do have this fun P&P retelling which works very well in this high school setting. In fact, there are so many different conversations had between characters that just made me smile because it worked so well. Especially between Colin and Lizzie and Lizzie and Wick, the ex-Pemberley boy who had been kicked out of school by the impossible Will Darcy. The decision to make Lizzie and Jane into roommates instead of sisters means there is some distance when it comes to Lydia's disgrace in the second half of the book, I feel like it works well enough not to raise any eyebrows. I especially love how Eulberg chose to place importance of the piano into the storyline and the ways in which Lizzie's eyes are opened to Will Darcy. This is a very cute story, one in which a lot of the magic and romance comes from the original Pride and Prejudice, but it's such a fun and light-hearted retelling that I feel most fans will be able to appreciate. I certainly did. It was a very sweet way to spend a few hours on a cold, miserable evening! I'm glad to hear it! I like a good retelling, myself! I like Eulberg, and love Pride and Prejudice adaptations, so will definitely be keeping an eye out for this one! Great review, thanks. You're weclome, Jim :) I LOVE P&P adaptations as well! I've been wanting to read Prom and Prejudice for absolutely ages! I refuse to let myself read it until I've read the original (I know, I'm a terrible reader! ), and reading reviews like yours makes me want to read Pride and Prejudice NOW so I can get to reading this one. I'm glad you enjoyed it. :) Great review! I hope you do, Zoe :) I've coming across a lot more stories recently which take inspiration or are retellings of classic books and I have to admit, I quite like 'em.